Android M's name was just announced officially days ago. The final version is almost there and would be released not so long. Although Android is being keep developed but the latest update to Android M is totally different since there is some major change that would change everything like new Runtime Permission. Surprisingly it is not much talked about in Android Developer community even though it is extremely important and may cause some big trouble in the near future. That's the reason why I decide to blog about this topic today. Everything you need to know about this new Runtime Permission including how to implement it in your code. Let's do it before it's too late. 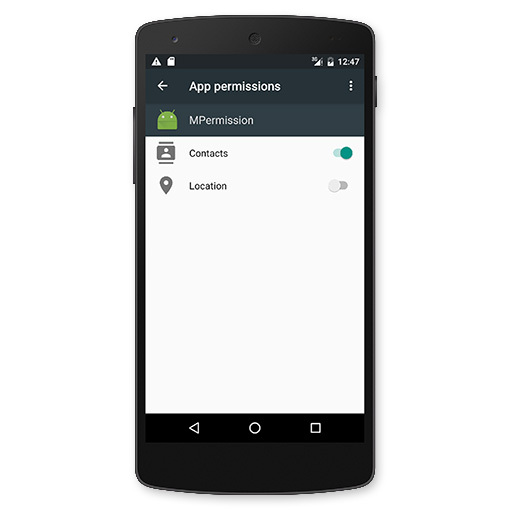 Android's permission system is one of the biggest security concern all along since those permissions are asked for at install time. Once installed, the application will be able to access all of things granted without any user's acknowledgement what exactly application does with the permission. No surprise why there are so many bad guys trying to collect user's personal data through this security weakness and use it in the bad way. Android team also know this concern. 7 year passed, finally permission system is redesigned. 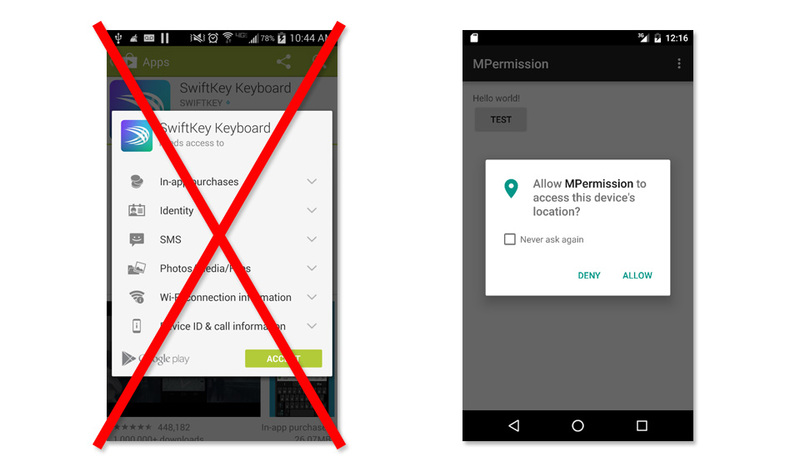 In Android 6.0 Marshmallow, application will not be granted any permission at installation time. Instead, application has to ask user for a permission one-by-one at runtime. Please note that permission request dialog shown above will not launch automatically. Developer has to call for it manually. In the case that developer try to call some function that requires a permission which user has not granted yet, the function will suddenly throw an Exception which will lead to the application crashing. Besides, user is also able to revoke the granted permission anytime through phone's Settings application. You might already feel like there is some cold wind blowing through your arms ... If you are an Android Developer, you will suddenly know that programming logic is totally changed. You cannot just call a function to do the job like previous but you have to check for the permission for every single feature or your application will just simply crash ! Correct. I would not spoil you that it is easy. Although it is a great thing for user but it is truly nightmare for us developer. We have to take coding to the next level or it will surely have a problem in both short-term and long-term. Anyway this new Runtime Permission will work like described only when we set the application's targetSdkVersion to 23 which mean it is declared that application has already been tested on API Level 23. And this feature will work only on Android 6.0 Marshmallow. The same app will run with same old behavior on pre-Marshmallow device. What happened to the application that has already been launched? This new permission system may cause you some panic right now. "Hey ! What's about my application that launched 3 years ago. If it is installed on Android 6.0 device, does this behavior also applied? Will my application also crash?!?" Don't worry. Android team has already thought about it. If the application's targetSdkVersion is set to less than 23. It will be assumed that application is not tested with new permission system yet and will switch to the same old behavior: user has to accept every single permission at install time and they will be all granted once installed ! As a result, application will run perfectly like previous. Anyway please note that user still can revoke a permission after that ! Although Android 6.0 warn the user when they try to do that but they can revoke anyway. Next question in your head right now. So will my application crash? Such a kindness sent from god delivered through the Android team. When we call a function that requires a permission user revoked on application with targetSdkVersion less than 23, no any Exception will be thrown. Instead it will just simply do nothing. For the function that return value, it will return either null or 0 depends on the case. But don't be too happy. Although application would not be crashed from calling a function. It may still can crash from what that application does next with those returned value. Good news (at least for now) is these cases may rarely occur since this permission revoking feature is quite new and I believe that just few user will do it. In case they do, they have to accept the result. But in the long run, I believe that there will be millions of users who turn some permission off. Letting our application not to work perfectly on new device is not acceptable. To make it work perfectly, you better modify your application to support this new permission system and I suggest you to start doing it right now ! For that application which source code is not successfully modified to support Runtime Permission, DO NOT release it with targetSdkVersion 23 or it will cause you a trouble. Move the targetSdkVersion to 23 only when you pass all the test. Warning: Right now when you create a new project in Android Studio. targetSdkVersion will be automatically set to the latest version, 23. If you are not ready to make your application fully support the Runtime Permission, I suggest you to step down the targetSdkVersion to 22 first. 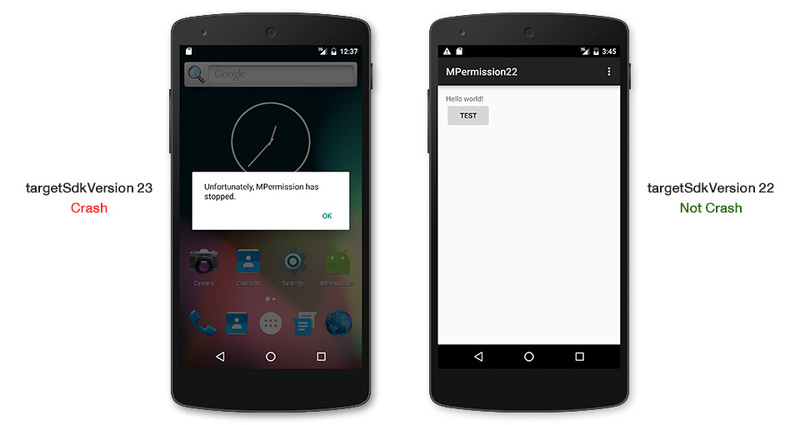 Just simply declare those permissions in AndroidManifest.xml and it will work just fine. No need to check for the permission listed above since it couldn't be revoked. Now it's time to make our application support new Runtime Permission perfectly. Start with setting compileSdkVersion and targetSdkVersion to 23. In this example, we try to add a contact with a function below. The above code requires WRITE_CONTACTS permission. If it is called without this permission granted, application will suddenly crash. 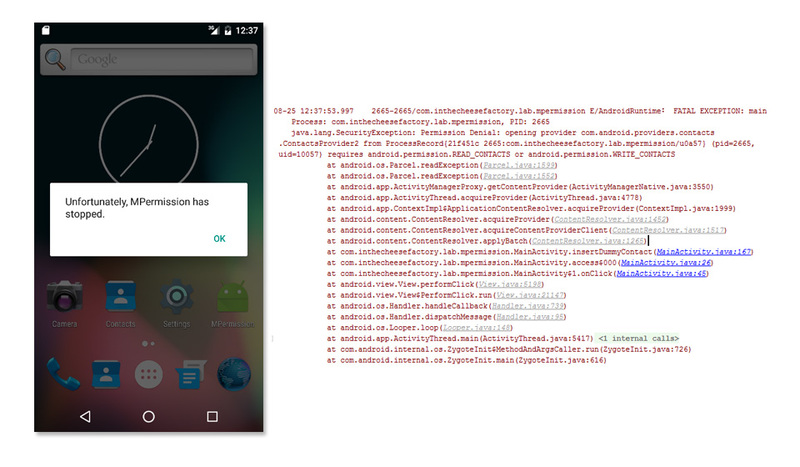 Next step is to add a permission into AndroidManifest.xml with same old method. Next step is we have to create another function to check that permission is granted or not. If it isn't then call a dialog to ask user for a permission. Otherwise, you can go on the next step, creating a new contact. Permissions are grouped into Permission Group like table below. If any permission in a Permission Group is granted. Another permission in the same group will be automatically granted as well. In this case, once WRITE_CONTACTS is granted, application will also grant READ_CONTACTS and GET_ACCOUNTS. Source code used to check and ask for permission is Activity's checkSelfPermission and requestPermissions respectively. These methods are added in API Level 23. If permission has already been granted, insertDummyContact() will be suddenly called. Otherwise, requestPermissions will be called to launch a permission request dialog like below. This is how Runtime Permission works. Code is quite complicated but be used to it ... To make you application works perfectly with Runtime Permission, you have to handle all the case with the same method shown above. If user denied a permission. In the second launch, user will get a "Never ask again" option to prevent application from asking this permission in the future. If this option is checked before denying. Next time we call requestPermissions, this dialog will not be appeared for this kind of permission anymore. Instead, it just does nothing. The result are rational dialog will be shown when this permission is requested for the first time and also be shown if user has ever marked that permission as Never ask again. For the latter case, onRequestPermissionsResult will be called with PERMISSION_DENIED without any permission grant dialog. There is definitely some feature that requires more than one permission. You could request for multiple permissions at a time with same method as above. Anyway don't forget to check the 'Never ask again' case for every single permission as well. Here is the revised code. When every single permission got its grant result, the result will be sent to the same callback method, onRequestPermissionsResult. I use HashMap to make source code looks cleaner and more readable. The condition is flexible. You have to set it by your own. In some case, if even one permission is not granted, that feature will be just simply disabled. But in some case, it will still work but with limited feature. There is no suggestion from me. It is all by your design. Although the code above works perfectly on Android 6.0 Marshmallow. Unfortunate that it will crash on Android pre-Marshmallow since those functions called are added in API Level 23. The straight way is you can check Build Version with code below. No matter application is run on M or not. This function will correctly return PERMISSION_GRANTED if the permission is granted. Otherwise PERMISSION_DENIED will be returned. If this function is called on pre-M, OnRequestPermissionsResultCallback will be suddenly called with correct PERMISSION_GRANTED or PERMISSION_DENIED result. If this function is called on pre-M, it will always return false. ALWAYS replace Activity's checkSelfPermission, requestPermissions and shouldShowRequestPermissionRationale with these functions from Support Library v4. And your application will work perfectly find on any Android version with same code logic. Please note that these functions require some additional parameter: Context or Activity. Nothing special to do, just pass what it wants correctly. Here is what source code will look like. These methods are also available in Fragment from Android Support Library v4. So please feel free to move these logics into the Fragment. You will notice that code is quite complicated. No surprise, there are quite many of 3rd party libraries out there trying to solve this big thing. I gave a try with quite a lot of them and finally found one that satisfy me. It is hotchemi's PermissionsDispatcher. What is does it exactly the same as I described above but just with shorter and cleaner code. Surely with some trade-off with flexibility. Please give it a try and see if it could be applied in your application. If it couldn't, you can go on the direct way which is also my choice right now. What will happen if permission is revoked while application is opened? As mentioned above, a permission can be revoked anytime through phone's Settings. I believe that you see the big picture of this new permission system quite clear right now. And I believe that you also see how big issue it is. However you have no choice. 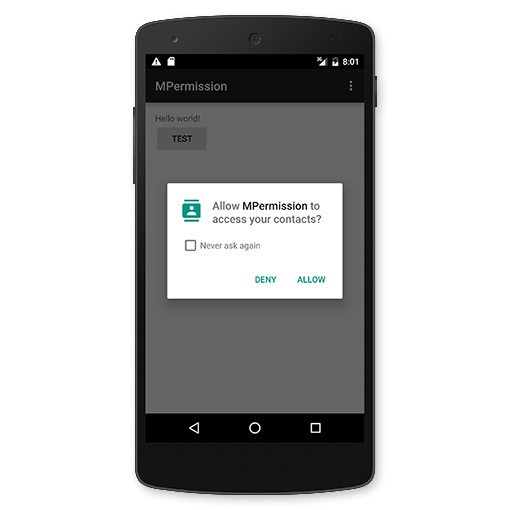 Runtime Permission is already used in Android Marshmallow. We are at the point of no return. Only thing we could do right now is to make our application fully support this new permission system. Good news is there are only few permission that requires Runtime Permission flow. Most of the frequently-used permissions, for example, INTERNET, are in Normal Permission are automatically granted and you have no need to do anything with them. In conclusion, there are just few part of code that you need to modify. 2) Don't set application's targetSdkVersion to 23 if your code is not yet supported Runtime Permission. Especially when you create a new project from Android Studio, don't forget to take a look at build.gradle everytime for targetSdkVersion ! In the man time, since permission concept is turned upside down. Right now if some permission is not granted, your application need to still be able to work with limited feature. So I suggest you to list all the feature that related to permission you requested. And write down all the case possible, if permission A is granted but permission B is denied, what will happen. Blah blah blah. Good luck with your code refactoring. Mark it as urgent in your to-do list and start do it today so it will contains no problem on the day Android M is publicly launched. Hope you find this article helpful and Happy Coding !